The new, 12,000 Lb Class Fx770 Qtv breaker replaces the popular F70 Qt, and offers unique features and proven design improvements. 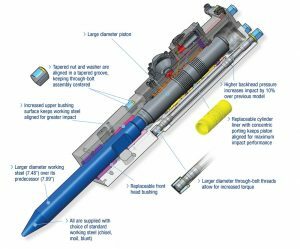 Even though it requires the same pressure and flow than its predecessor, the Fx770 is designed to produce increased impact as a result of a significant increase in backhead pressure. It is also able to work on a wider range of carriers (48.5-ton to 83-ton). 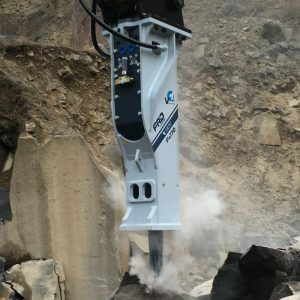 This breaker is the perfect choice for working in quarries, breaking hard rock or taking on large demolition jobs. Several improvements to the through bolts increase durability, while a replaceable cylinder liner with concentric porting increases tool life. An anti-idle blow feature increases durability and performance. There is a coating applied to the breaker’s cylinder liner and valve, which reduces time-consuming maintenance and greatly increases the level of reliability. Impact Energy Class 12,000 ft. lbs. *Note: Total weight and total length include standard working steel and universal top cap less mounting pins and bushings.